Enjoy looking at pictures dogs? Then you'll love these adorable dog photos -- everything from funny dog photos to cute dog pictures! 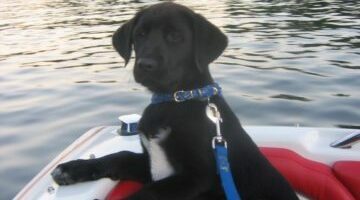 Cute Puppy Pictures – Bet You Haven’t Seen Puppy Photos Cuter Than These! Photos Of Dogs And Bunnies – Yep, Our Dog Found Some Rabbits… Again! It has happened again!… Our dog discovered a rabbit hole in our backyard and his attention could not be diverted away from the bunnies until the last one left the nest. Here are photos of dogs and bunnies. I don’t usually put doggie bling like dog clothing & accessories on my dog. But we recently got a dog bandana as a hand-me-down from someone on Freecycle. And I have to be honest, I didn’t realize just how practical doggie neckwear could be! I’m a huge fan of dog bandanas. Here are fun photos of dogs wearing bandanas and necklaces. 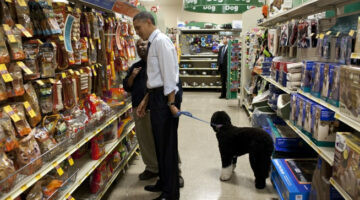 The Cuteness Pet Community Has Ongoing Cute Dog Contests …And More! 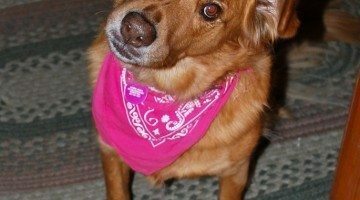 Have you ever wanted to include your dog in a cute dog contest online? Now there’s a pet-friendly website that makes it possible for you to include your dog in a ‘cutewar’ every day if you wish! And if your cute dog pics get high enough ratings, you can even win some fun prizes. 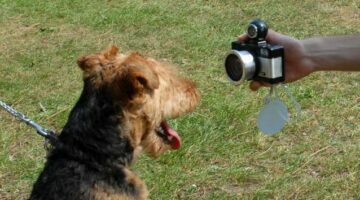 Dog photography takes time and patience, but even amateur photographers like you and me who simply want to take better pictures of our dogs can do these simple things to improve our dog photos. 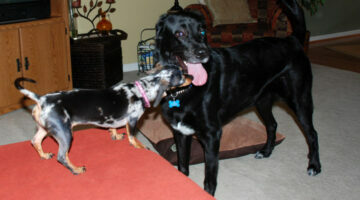 Check out our big dog’s first meeting with a miniature dachshund. It was hilarious! What follows is my growing collection of dogs that have been photographed wearing Halloween costumes. Looking through these might stir up the creative juices and you just might get some interesting ideas for costumes to make for your own dog. Another funny dog tongue picture. Two dogs on a trampoline. Wallace is Johnny Reid’s beloved dog. And boy, has this ‘ol dog got some stories to tell! Here are some pictures from my afternoon with Wallace, plus the story behind the song, My Old Friend — the song Johnny Reid wrote after Wallace died. Some recent headlines featuring Paris Hilton and her dog, Tinkerbell… plus photos of Paris with Tinkerbell. 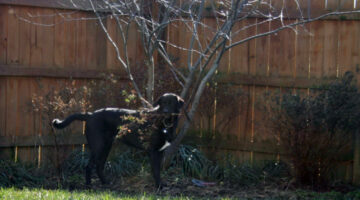 Dogs Who Like Sticks… May Uproot Your Trees! Our dogs love to chew on sticks. Much like they like to snap open the shells of peanuts and spit out the crumbs. Here’s a little story about one of our dog’s and his personal mission to de-shrub our backyard! For those who enjoy the sight of a dog sprinting… with full-out dogged determination and a purpose… You’ll surely enjoy these running dog photos. Running brings pure joy… as seen in these dogs’ eyes. Check out this picture of a ferocious dog pack attacking a defenseless aligator! Let Sleeping Dogs Lie… Just Snap A Quick Photo First! Enjoy the following pictures of dogs in all their glory – fast asleep and minding their own business! Learn a little about the English Bulldog, as a symbol of the U.S. Marine Corps. Plus, see pictures of Hummer, the 7-month old English bulldog I photographed at my nephew’s graduation from Boot Camp at Parris Island. We taught our dog to put his chin to the ground and stay in that position until we say ‘Amen.’ It’s toooooo cute! This is our dog Jersey saying prayers on our bed. See pictures of Anna Nicole Smith with her white Maltese named ‘Marilyn’, her black toy poodle named ‘Sugar Pie’, and her Shih-Tzu named ‘Puppy’. Enjoy! For all you Jessica Simpson fans… It appears that Jessica is also quite a fan of dogs. Especially of the tiny, furry, perfectly cute variety! Jessica’s adorable little puppy, Daisy, is a Maltipoo. Pink and Cary Hart certainly have some interesting stories to share about dogs… I think, together, Pink and Carey Hart have had at least four different dogs — and a million different tattoos. Stay up to date with what's happening on The Dog Guide. From Dog Care tips & Dog Health issues to Tricks & Training tips and other Fun Dog Stuff... you'll always be the first to see these helpful tips as soon as we publish a new article.